What is the Jobs For Life Program? Unemployment and underemployment is a global problem that must start locally to solve. Nearly 3 billion people live in poverty, and 1.3 billion live in extreme poverty. Just let that sink in for a second. That is half of the world population. Jobs for Life. It’s a term we use often, but it means so much more than something we hope to give our Forward Training Center students in Hood County. Jobs for Life is a nationwide program that focuses on uniting churches, ministries and local businesses from all over. The JFL mission is to prepare men and women for meaningful work in their communities through relationships, mentoring, workforce development training, and much more. Forward Training Center is so fortunate to facilitate and adopt the Jobs for Life program. Twice a year, FTC accepts students into the program at no cost to the students. Our goal at Forward Training Center is to break the cycle of poverty in Hood County, and to provide life-changing growth to those who need in in our community. We believe that Jobs for Life directly ties into our mission, and love that the focus begins with meaningful work. Nothing attacks one’s dignity like a lack of work, and a lack of opportunity to get there. Joblessness is one of the main factors contributing to poverty, crime, homelessness, domestic violence, substance abuse, depression, and much more. We encourage you to see how JFL explains that they Flip the List on the perspective of poverty. The program at FTC includes Faith-based trainings, knowledge to start a career, a one-on-one relationship with a mentor, and occasionally even free meals and childcare to those who need it. 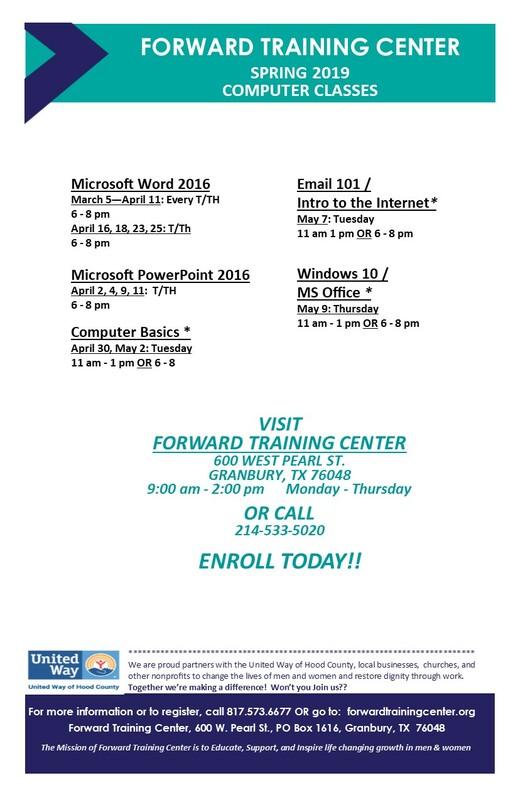 Interested in finding out more about the Jobs for Life program or other classes offered at Forward Training Center of Hood County? We are always looking for local businesses to partner with, volunteers, and even more students. Call us Monday-Thursday from 9-2 at 817-573-6677.